When Susan’s car failed, it was cause for great panic. She was on a busy interstate, during evening hours with her two children in the car and in the left-hand lane. Once stopped, she quickly realized her flashers were not working! This was the type of scenario she had seen many times on the news, and it did not end well. Her panic increased when she saw a tractor trailer in her mirror and thought the worst. Luckily, Timothy Ross, the driver of the tractor trailer had recognized the situation and was stopping to help. After details of the problem were discussed, Tim kept his unit parked behind the out of service vehicle with his flashers on, both protecting the family and providing warning for approaching cars to remain clear. An over the road truck driver, who is paid by the mile, stayed with the family on his own time, making sure they were safe for over an hour until emergency crews arrived. Mr. Ross is employed by Gypsum Express LTD out of Baldwinsville, NY, whose logo happens to be “Our Drivers Make the Difference”. A grateful Susan reached out to the company to let them know what Tim had done and to express her extreme appreciation for his caring and sacrifice. 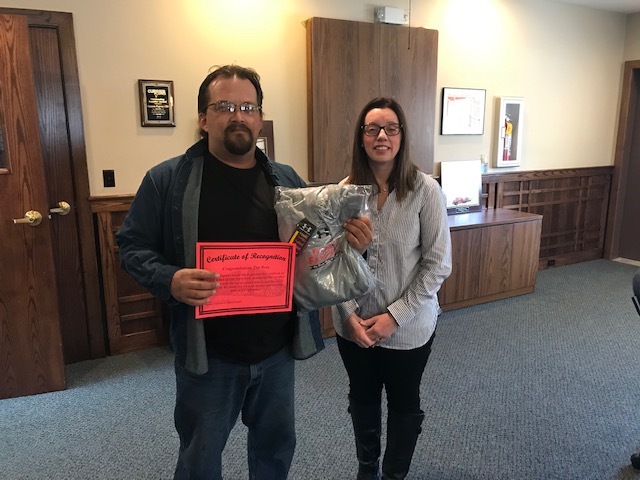 In recognition of his meaningful impact and high-level professionalism, the company presented Tim with a one of a kind, custom made sweatshirt and a certificate of appreciation. The trucking industry is often portrayed in a negative light, but there are many examples of the hard-working men and women of trucking being heroes of the road. Mr. Ross is a perfect example of this and HE truly made a big difference.